If you&apos;ve ever gone through the Angular 2 Quickstart or our Angular v4+ Getting Started Course over the past year, you&apos;ll know that a big part of getting started with Angular 2 is the setup. Talk about a lot! Thankfully, at ng-conf 2016, the Angular team announced a tool that will make creating and scaffolding Angular 2 applications incredibly easy. There are many things that the CLI can do so let&apos;s get it installed and walk through some features. To install the CLI, we&apos;ll use Node and npm. That&apos;s it! Now we can start using the CLI to build out our applications. It&apos;s important to take note of this directory structure and where the files are located because the application that the Angular CLI generates follows the recommended app structure and style guide. The majority of our application is under src/app. This is where we will be working and everything that gets compiled and is available to our final application will be built to the public folder. Learn from this stucture and style guide and incorporate these things into your own development. 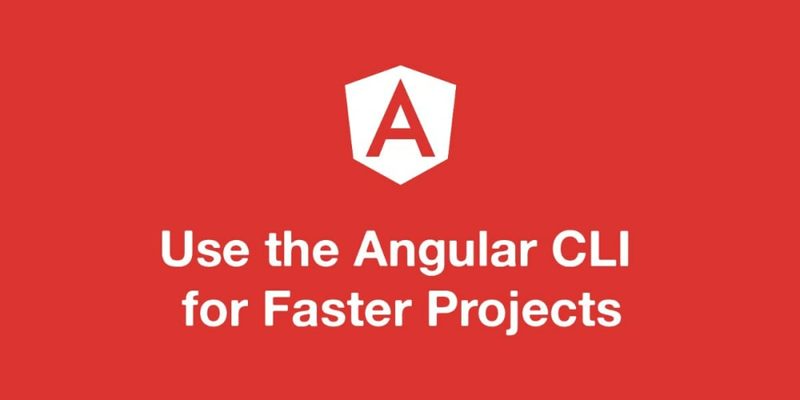 The Angular CLI will not only create the files and folders, it will also install any npm dependencies required. All those dependencies are added and included in our src/index.html file. All of the setup that was in the Angular quickstart are now taken care of for us. Notice that there&apos;s packages for testing with Karma and Protractor and it&apos;s great that the CLI handles the beginning setup for testing for us. (We all know adding in testing isn&apos;t the first thing on our list when starting new projects). Check out the src/index.html file and you&apos;ll see the beginning of our application with <app-root></app-root>. Our entire Angular app will get injected here. In previous CLI versions, we would also find the script tags for our dependencies here. Since the CLI is now using webpack, all of the following will be injected for us when serving (developing) or building (production) our application. --style: (Default: css) The style file default extension. Possible values: css, scss, less, sass, styl(stylus). You can later change the value in ".angular-cli.json" (defaults.styleExt). --routing (Default: false) Generate a routing module. Let&apos;s say you already have a folder that you&apos;ve started working in. The ng init command is here so that you can use the current folder you&apos;re already working in. Another really cool thing that our CLI allows us to do is to serve our application in the browser. Previously, we would have to create a server using lite-server or create our own Node (or other) server. What features are given to us with our new server? That&apos;s a ton of functionality and helps speed up development. First let&apos;s talk about the options that we can use for all of the above. --flat: Don&apos;t create the code in it&apos;s own directory. Just add all files to the current directory. --route=<route>: Specify the parent route. Only used for generating components and routes. --skip-router-generation: Don&apos;t create the route config. Only used for generating routes. --default: The generated route should be a default route. Now we can run through each and see exactly what gets created and how the Angular CLI makes life easier. If you use ng generate component HelloComponent, then your component class will be an undesirable HelloComponentComponent. Our new component is relegated to its own folder within the src/app folder. We have all the parts (including tests) that we need for our new component. In addition to generating components, we can generate modules. Modules are a way we can encapsulate similar functionality into a section of our app. By separating parts out into their own section, we can treat that module as its own compartment of our app with routing. This will become child routing for our app and then we can even lazy load it! To generate a module, we can use ng generate module. To add routing to it, we can add the --routing flag. We now have a brand new AboutModule that we can include in our main AppModule. So far we&apos;ve only created a module. Let&apos;s say we wanted to build out components within this module. This AboutModule could have a UserComponent to display owner profiles for Scotch. Let&apos;s generate the component with a little trick. We can generate a component to be part of a module. We now have our new UserComponent and it lives inside the about folder. We can now use it and route to it using the provided files. When we want to prepare our Angular app for deployment, we only need to run one command. The build will take all of our files and bundle them into five main files. It will also generate everything into a dist folder. Go ahead and take a look in there and you&apos;ll see your deployment ready files. You&apos;ll even notice the index.html file that has all those scripts already injected for you. Open that index.html file in browser and your Angular app works! We can also build for production to get some more efficiently sized bundles. Tree shaking goodness and more! We can also build with AOT to make sure our Angular app is compiled during build-time instead of in browser at run-time. This can help reduce the size of our app by more than half! Once you do that, notice the difference in bundle sizes from the previous non-aot build. As the CLI get&apos;s more hashed out and more information, we&apos;ll be filling out this section with more commands and what they do. Some of these commands were a little buggy when we first tested out the CLI since it&apos;s in v1.0.0-beta.1 at the time of this writing. The Angular CLI team has put together a section of the site called Stories that runs through popuplar real-life scenarios. Give it a look! The Angular CLI is an amazing tool and one that comes at a time when more and more people are getting into Angular 2 development. After all the announcments at ng-conf 2016, now is the time to dive in. The CLI makes diving in that much more accessible since setup, which took up the majority of the time for first-time developers is now handled for us.